LAST CHANCE TO SEE – ´Music of the Night´ in 2014 – 1 November – H10 Andalucia Plaza, Puerto Banus, Marbella | Marbella Marbella – Adelante! We are delighted and very excited to announce, that following full capacity and sell-out shows at The Starlite Festival Marbella and The Mijas Auditorium in August, the popular highly acclaimed 2 hour show ´Music of the Night´ is returning to the Costa del Sol one last time this year to the H10 Andalucía Plaza Hotel, Puerto Banus, Marbella on Saturday 1st November 2014 at 9.30pm. The show will take place in the fantastic Salon Castilla. Advance ticket purchase is essential as this show is predicted to sell-out again well before the date. The show will again comprise highlights of the popular and previously sold-out productions of, ‘West End Musicals in Concert’, ‘Encore! 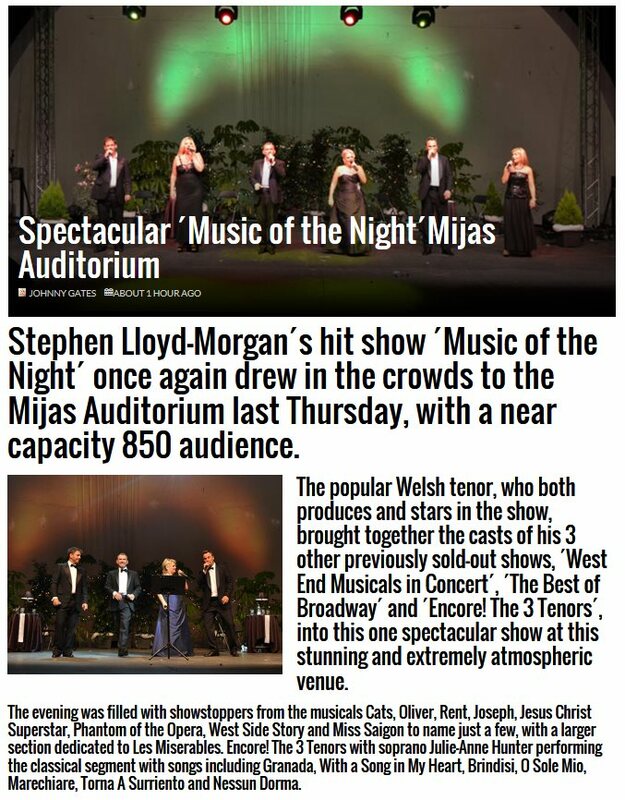 the 3 Tenors’ and ‘The Best of Broadway’, starring the outstanding cast of International Tenor Stephen Lloyd-Morgan, International Soprano Julie-Anne Hunter; together with the amazing voices of Adele Lee Peters, Lucy Indrisie, Raúl D’Abreu and José Santos. ´West End Musicals in Concert´ songs from shows such as Jesus Christ Superstar, Hair, Evita, Miss Saigon, Wicked, The Lion King, Joseph, Cats, Oliver, Chicago, Phantom of the Opera, Les Misérables and Miss Saigon. ´The Best of Broadway´ songs from the era of The Golden Age from shows such as The King & I, West Side Story, Carousel, Oliver, South Pacific, The Sound of Music, Anything Goes, Kiss Me Kate, Show Boat, Annie Get Your Gun, Gypsy, Guys & Dolls, Oklahoma and My Fair Lady. Songs in this show will be in English, Spanish or Italian. ON THE NIGHT TICKETS – €30 Silver and €40 Premium. 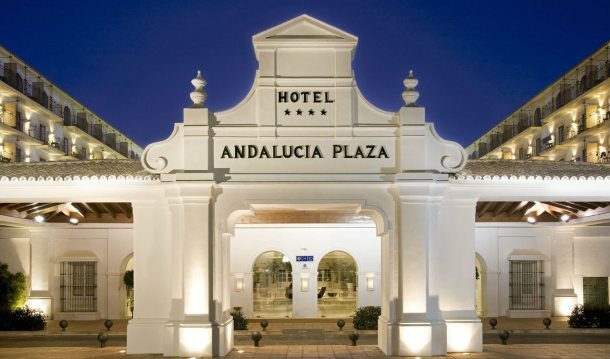 Tickets purchased online can be collected from the ticket point in the lobby of the H10 Andalucía Plaza Hotel between 7.00pm and 8.30pm on the evening of the show, Saturday 1st November. Bars open throughout the evening. There will be an interval during the show. The show will finish at approximately 11.40pm. Please note that all tickets must be pre-purchased, either from the ticket sales points or online. As this show is predicted to sell-out before the date there is no guarantee of any ticket availability on the night. Somos encantados y es para nosotros un placer de anunciar que después de los espectáculos que eran “Entradas agotada!” en el Starlite Festival de Marbella y El Auditorio de Mijas en agosto, el espectáculo popular de 2 horas muy aclamado ‘Música de la Noche’ está volviendo a Marbella por última vez este año. Este espectáculo estará compuesto por lo más destacado de los producciones más populares y con mayor éxito de “Concierto de musicales de West End”, “Encore! 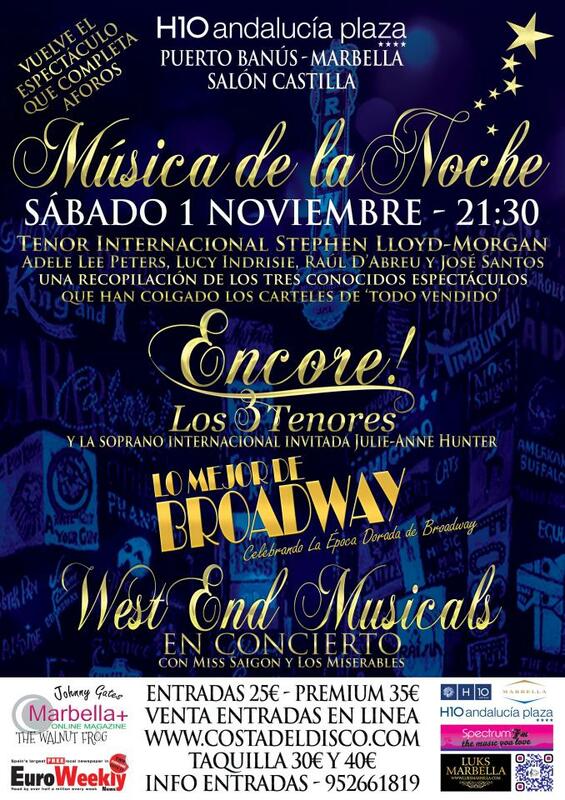 Los 3 Tenores” y “Lo Mejor de Broadway”, protagonizad o por el magnífico Tenor Internacional Stephen Lloyd-Morgan, la Soprano International Julie-Anne Hunter; juntos con las increíbles voces de Adele Lee Peters, Lucy Indrisie, Raúl D’Abreu y José Santos. “Encore! Los 3 Tenores”: Granada, Santa Lucia, La Donna è Mobile, Caruso, Funiculi Funicula, Marechiare, Volare, Brindisi, Besame Mucho, Nella Fantasia, Una Furtiva Lagrima, Nessun Dorma, Notte Di Luce, Torna A Surriento, Hallelujah, Mamma, If I Love You, Sogno, Amapola, With a Song in My Heart, La Danza. 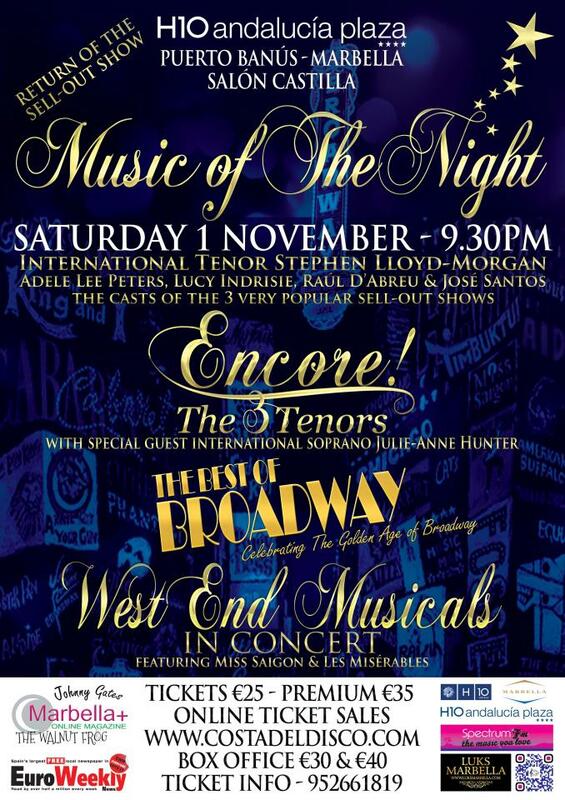 “Concierto de musicales de West End” canciones de espectáculos como Jesucristo Superstar, Hair, Evita, Miss Saigon, Wicked, El Rey León, Joseph, Cats, Oliver, Chicago, Fantasma de la Ópera, Los Miserables y Miss Saigon. “Lo Mejor de Broadway” canciones de espectáculos de La Época Dorada como The King and I, West Side Story, Carousel, Oliver, South Pacific, The Sound of Music, Anything Goes, Kiss Me Kate, Show Boat, Annie Get Your Gun, Gypsy, Guys & Dolls, Oklahoma y My Fair Lady. Las canciones en este espectáculo serán cantadas en español, inglés e italiano. Las entradas se pueden comprar en este sitio web o en cualquiera de los puntos de venta (ver lista). La venta de entradas “On line” utilizan el servicio de PayPal, es seguro y protegido y también acepta tarjetas de crédito. Al hacer clic en el botón http://www.costadeldisco.com/buy_tickets.html se le llevará a una página segura donde puede seleccionar la cantidad de entradas que desea, efectuar la compra, realizar el pago y luego recibirá un email de confirmación que deberá imprimir y llevar a la mesa “Entradas compradas” en el salón Castillo en el H10 Andalucía Plaza, entre 19.00 y 20.30 se obtendrá su entrada(s) cuando se presente el correo electrónico. Compra de entradas en taquilla será solo en efectivo.